The FSCC masonry program provides students with a hands-on approach to delivery of National Center of Construction Education and Research ( NCCER) industry-developed curriculum. FSCC’s Construction Trades program allows a student to earn industry recognized credentials at many levels. Through articulation agreements between area high schools and FSCC, students are provided a seamless path to pursue their educational goals. Through the program, students can earn a certificate in masonry. In addition to a certificate, students can earn industry recognized credentials through NCCER in masonry. These credentials will be entered into a national registry that is portable and available to contractors. Through articulation agreements between FSCC and area high schools, high school students have a seamless path to pursue their educational goals. 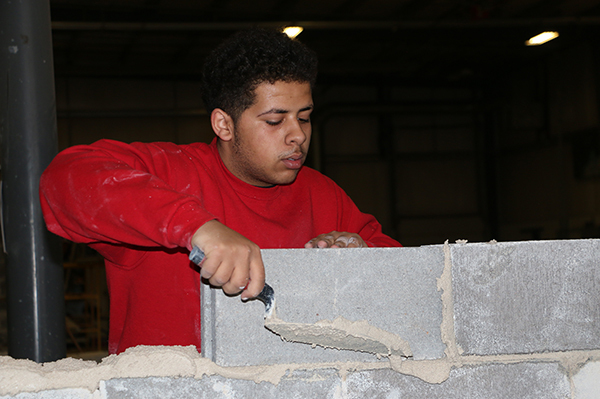 Students can enroll in masonry courses as early as their junior or senior year in high school. According to the 2010-2011 edition of the Occupational Outlook Handbook, published by the Bureau of Labor Statistics, the employment outlook for masons is excellent—job growth of 12% is expected through the year 2018. The Handbook indicates that more jobs will go to those “with thorough training that can work on complex structures.” Many masons in the current workforce getting closer to retirement age. The Occupational Outlook Handbook anticipates many jobs becoming available due to the large number of masons retiring in the next 10 years. The average mason earns between $16.77 and $28.46 an hour. Please click here for more information about gainful employment for the masonry certificate.